Looking for deals in Bordeaux? 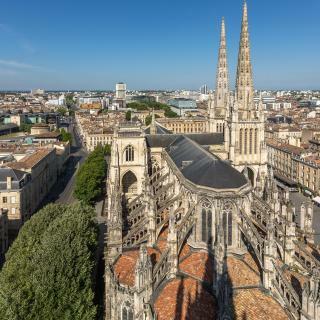 Offering air-conditioned rooms in the Bordeaux City-Center district of Bordeaux, Hôtel Cardinal is 328 feet from Saint-André Cathedral. The property is an 12-minute walk from Grand Théâtre de... The service was the absolute best! They were extremely accommodating and helpful throughout our entire stay. Barbara, helped well in advance to arrange a wine tasting tour, personal driver, booked dinner reservations and even arranged for dinner in our room when our arrival flight was delayed and got to town too late to go out. We've been sharing our story on our stay with everyone who's expressed interest in going to Bordeaux and know that we will be back and where exactly to stay now! Hôtel des Voyageurs offers accommodations in Bordeaux next to Stalingrad Tram Station and less than a 5-minute walk from the Stone Bridge. All rooms have a flat-screen TV. Right across the bridge from the main city. Quiet location. Booked the day of as I was driving because my AirBnB fell through. Breakfast was good! The owner was lovely. Set in an 18th-century mansion, Hotel de Tourny is located in the heart of Bordeaux historic district. Everything especially friendly staff and excellent breakfast. A luxury hotel set in a 19th-century private mansion in the heart of Bordeaux's historic center, Yndo Hôtel features a fragrance garden and a shaded terrace, where guests can enjoy a chic yet restful... This elegant, stylish and comfortable hotel offers amazing service and delicious, fresh meals. It is hands down the best hotel we have ever stayed at, in any country. Located in Bordeaux, Hôtel Le Palais Gallien is a 15-minute walk from Esplanade des Quinconces and offers facilities like seasonal outdoor swimming pool. We had amazing experience in the hotel. The hotel is completely new, clean, well designed and good smelling. Also it provides all the services and facilities of 5 star hotel, it still keeps personal, family like touch. A lot of attention was put in thinking about small details and little exciting surprises. One of them a hand written greetings every evening with basic information about the next day. And you have a lot of other good tributes. The staff is extremely helpful, creative and friendly. The location is 5-10 minutes walk from the center, very quiet and close to public park, which is good for running or jogging. This Novotel sits on the shore of Bordeaux Lake and has an outdoor swimming pool with sun loungers and umbrellas. Very good location well served by public transportation. Wonderfull freindly staff. Located in Bordeaux, a 20-minute walk from Stone Bridge, Hilton Garden Inn Bordeaux Centre provides accommodations with a terrace. Providing a restaurant, the property also features a bar. Benjamin at the front desk was extremely helpful with check in and dinner recommendations. The Best Western Premier Bayonne Etche-Ona is located in the Golden Triangle of Bordeaux and made up of two 18th-century houses, the Bayonne and the Etche-Ona. Clean, comfortable, updated, extremely quiet and excellent air conditioning. Located 984 feet from Saint Jean Train Station, and a 10-minute tram ride from the city center, ibis Bordeaux Saint-Jean offers a bar and free Wi-Fi in the hotel rooms. Very helpful staff who took the additional time to point out places of interest. Hôtel de Sèze is located a 5-minute walk from the Grand Théâtre in the center of Bordeaux and features air-conditioned rooms with an LCD TV, a restaurant and a spa center. The front desk staff, Anna and Barbara, were amazing! Set in an 18th-century mansion house decorated in a style characteristic of Bordeaux, this 4-star hotel is located 328 feet from Saint-Jean TGV Train Station. Great staff, breakfast and comfortable bed. 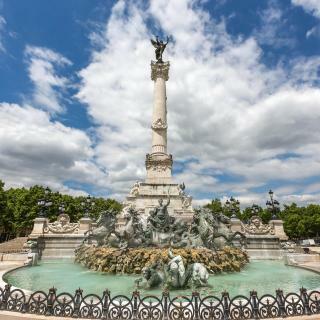 Hotel de la Presse is located in Bordeaux city center, beside Rue Sainte-Catherine, and less than a 5-minute walk from the Grand Théâtre and Quinconces. It offers free Wi-Fi access. Excellent location in the center of town. This 4-star Mercure is located 164 feet from Tram C station, a 3 tram-stop ride from the heart of Bordeaux and the Place de la Bourse and only 1312 feet from Bordeaux Train Station. The hotel was located a short walk away from the train station. 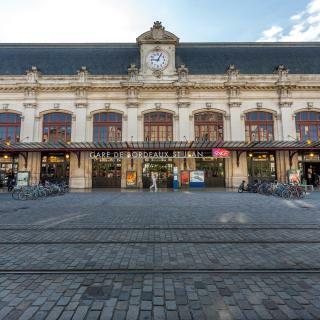 The 3-star Campanile Bordeaux Center - Gare Saint-Jean is located 328 feet from Bordeaux Train Station and from a Line C tramway station and a 10-minute walk from the historic center of Bordeaux. Really pleasant and well situated hotel. Friendly staff and good breakfast too. Set in a 19th-century old mansion, Quality Hotel Bordeaux Center is located near the lively Saint-Pierre district, surrounded by restaurants and boutiques, and 5 mi from Nouveau Stade Bordeaux. Very comfortable bed and bedding. Plenty electric for charging. Clean. Nespresso. Refrigerator. A 5-minute walk from Stalingrad Tram Stop and a 40-minute drive from Saint-Emilion, ibis Bordeaux Center Bastide was renovated in May 2018. The room was clean and the bed was super comfortable. Hôtel des Voyageurs offers accommodations in Bordeaux next to Stalingrad Tram Station and less than a 5-minute walk from the Stone Bridge. All rooms have a flat-screen TV. Right across the bridge from the main city. Quiet location. Featuring a garden, Hotel des Quinconces is located in Bordeaux, 295 feet from CAPC Musee d'Art Contemporain. This 5-star hotel offers a terrace. The property offers a 24-hour front desk. Great visit, hotel staff were wonderful! Directly opposite the Grand Théâtre, this 5-star hotel is in the heart of the historic center of Bordeaux. Everything except the breakfast. 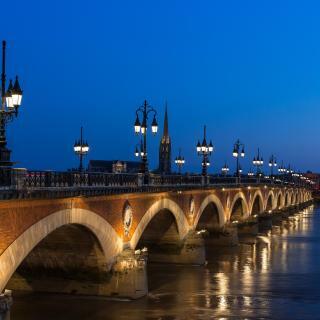 Hotel Seeko’o is located in the heart of Bordeaux on the banks of the Garone River. The staff was very friendly and accommodating. We felt welcomed and appreciated. How much is a hotel in Bordeaux for this weekend? The average price per night for a 3-star hotel in Bordeaux this weekend is $187 or, for a 4-star hotel, $267. Looking for something even fancier? 5-star hotels in Bordeaux for this weekend cost around $592 per night, on average (based on Booking.com prices). 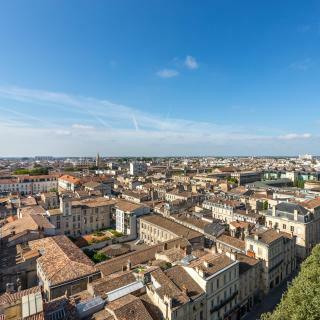 Which neighborhood is the best one to stay at in Bordeaux? 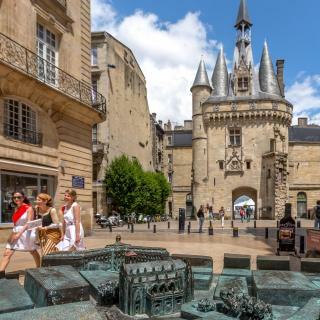 Bordeaux-Lac, Bordeaux City-Centre, and Bastide are popular with other travelers visiting Bordeaux. Which hotels in Bordeaux offer an especially good breakfast? 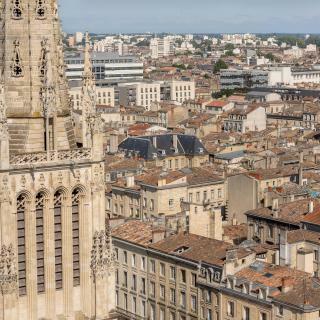 For hotels in Bordeaux that serve highly-rated breakfasts, try Amicalement Hôte, La Grande Maison de Bernard Magrez, and Golden Tulip Bordeaux Euratlantique. Which hotels in Bordeaux are good for couples? These hotels in Bordeaux are highly rated by couples: Hôtel Le Palais Gallien, La Grande Maison de Bernard Magrez, and Yndo Hôtel. How much does it cost to stay in a hotel in Bordeaux? On average, 3-star hotels in Bordeaux cost $88 per night, and 4-star hotels in Bordeaux are $145 per night. If you're looking for something really special, a 5-star hotel in Bordeaux can be found for $353 per night, on average (based on Booking.com prices). How much is a hotel in Bordeaux for tonight? On average, it costs $95 per night to book a 3-star hotel in Bordeaux for tonight. You'll pay around $134 if you choose to stay in a 4-star hotel tonight, while a 5-star hotel in Bordeaux will cost around $266, on average (based on Booking.com prices). Which hotels in Bordeaux are good for families? Many families visiting Bordeaux loved staying at Amicalement Hôte, Hôtel Le Palais Gallien, and La Grande Maison de Bernard Magrez. Which hotels in Bordeaux have nice views? Hôtel Le Palais Gallien, La Grande Maison de Bernard Magrez, and Hotel des Quinconces got great room view-related reviews from travelers in Bordeaux. Which hotels are the best ones to stay at in Bordeaux? Hôtel Cardinal Bordeaux Centre, Golden Tulip Bordeaux Euratlantique, and Yndo Hôtel are some of the popular hotels in Bordeaux. What are the best hotels in Bordeaux near Mérignac Airport? Travelers who stayed in Bordeaux near Mérignac Airport (BOD) have said good things about Sure Hotel by Best Western Bordeaux Aéroport, Mercure Bordeaux Aéroport, and ibis budget Bordeaux Aéroport. What are the best hotels in Bordeaux near Rue Sainte-Catherine? Some of the best hotels in Bordeaux near Rue Sainte-Catherine include L'Appart D'Oli et Tiane, La Maison Fernand and Trois Chandeliers. Love Bordeaux, best large City in France. Love Bordeaux, best large City in France. Easy walking, great culture, history and architecture. The hotel was perfectly situated but not too close to the night life that you couldn't get a nice quiet sleep. Staff was great, spoke English very well and we're very helpful. We made a reservation for our way home. Entrecote, kitchy but great, the fries are the best! Tram service does not cover the whole city but is efficient and cheap. We didn't use buses. Uber served us well elsewhere. It was extremely unpleasantly hot in August so air conditioned accommodation is advised. A pool is a huge plus. The fountain on Place Quinconces is quite beautiful. The Miroire d'Eau was very average but may be special at night. I have no complaints about Bordeaux. I have no complaints about Bordeaux. What a wonderful city! If you love good food, good wine, reasonable prices, great museums and cathedrals that allow photos to be taken, lovely outdoor scenery and markets, this is your place. We would especially recommend the new "Cite du Vin" which opened in June, 2016. It has many technological wonders and you will learn all there is to know about wine. You'll taste some wine, too. At 20 euros for an adult ticket, I still consider it a bargain. Plan AT LEAST for four hours to do it total justice, but you could spend a whole day there. It is also enjoyable if you have less time. The view from the panorama room at the top, where you drink your wine, is probably one of the best views in Bordeaux. One must also experience the lovely reflecting "pool" down by the older area and next to the river. Especially when the lights are on (which isn't until after 10pm in July) the sight is spectacular and you can get some amazing photos. I enjoyed the food at the Mercure hotel by the Meriadeck shopping center. The food was truly outstanding, and I'm happy it was our conference location. A beautiful city undergoing a renaissance. A beautiful city undergoing a renaissance. Already an oenophiles dream. Bordeaux is quickly emerging as a bourgeoning foodie paradise. The old town section is vital with buzzy bars and cafes, great restaurants, and fantastic shopping. Wine tours galore can occupy your days in the beautiful Chateau dotted countryside, with charming, romantic villages. A great trip for a three or four day visit. Looking for a place to stay - try the Hotel de Tourny. Fan static, small, charming boutique hotel that is absolutely chic, modern (in the best way) and beautiful. Bordeaux is a beautiful city and I would highly recommend it. It has everything a city break should offer - great architecture, great shopping from budget to designer clothing, galleries, chain and individual retail shops. The are loads of places to eat for all budgets and loads of bars, coffee shops etc. We combined our trip with a visit to the Grand Theatre to see a ballet which was superb! The theatre itself is worth a visit in its own right, it's beautiful. The Bordeaux ballet company is excellent, I have seen 3 ballets there and it has never disappointed. Also have tea in the Grand Hotel opposite, a great opportunity to see the interior of this lovely building. Or could could try a cocktail in the rooftop bar of the hotel but be warned, it's pricey! Even if you stay outside the centre of the city, the tram system is cheap and brilliant. Parking centrally is available about €25 for 24 hours which compared to other cities is relatively cheap. Often hotels will have their own but book early because their spaces are limited. However, if you stay more than 2 nights, they can often give guests some discount on the public parking. I can't wait to go again! I love everything about my short stay in Bordeaux. With the proximity of my hotel I was able to see the popular sites. The wine was amazing and I am not a fan of red wine but Bordeaux is known for the best wine and it did live up to the standard. I loved seeing many runners near Quai Louis, as I am runner, it spoke to me. I want to return very soon and stay much longer. I visited during the Christmas season 2015 and it was a wonderful experience with the Marche de Noel and all the holiday decorations. I would love to be here again for the holidays. For a hotel designed and built almost a decade ago , a stay at Deeko’O was a wonderful experience. The staff were all very helpful and friendly and location excellent. The Rooms are beautifully designed with great thought into the facilities. The shower and bathroom had the best and most functional fittings I have experienced in France and of course the bed was very large and very comfortable. Functionality and quality is amazing. The breakfast was the best I experienced during my 2 week road trip. A must stay during my next visit. A new and modern hotel, clean lines and modern comfortable fittings. A lot of thought has gone into interior design. Staff are well mannered, friendly whilst efficient and professional. Breakfast is good and varied and evening meal as you’d expect of a restaurant in 4star in France. Rooms are clean, modern all with good moonshower (no baths). Have a drink from bar after a days sightseeing/shopping and relax on ‘swing chairs’ - overall a v pleasant stay. New Guesthouse of modern style! So clean, elevator for all floor. Cafeteria where we can work with drink&snacks in ground floor, rest with sofa in rooftop. 24hour reception desk. The staffs are so kind too. It is located in middle of the main street but calm. So easy to take the public transportation too. I’m sure that it’s the best Guesthouse in France. We must not expect more. Very nice place. Photo fully reflects the estate. Room is quite big for France, very very comfortable bed (we are travel a lot), a lot of places/usb for device loading, clean, modern charm. Very nice and welcome personal. Walking distance till main attraction but calm part of Bordeaux with 2 min till bus/tram stop if you prefer transport. The location is amazing. If you travel by train or a bus, they all stop at the main station which is St. Jean, 10 meters away from the hotel! The hotel is rated 3 stars but the rooms are equipped with great facilities and amazing service from a very caring and polite staff members. I highly recommend this place for your next trip to Bordeaux. This is the fourth hotel we have stayed at Bordeaux Lac on a stopover from Spain and by far the best. More expensive but worth it for comfort, space and for being totally dog friendly. Better staffed than the other hotels we stayed in so the service is much better. Lovely indoor children’s play area too. Beautiful boutique hotel close to both city centre with all its sights and to transport (tram & bus from/to airport). Proprietor & staff couldn’t be nicer or more helpful. Great advice about restaurants and sights to be seen given. Generous breakfast also. The rooms were very clean and big. The hotel staff was courteous and helpful. It’s located close to the city centre.. a drive of 5 mins (if you don’t get stuck in traffic) or a half and hour stroll with some really nice boutique stores. The hotel was in the heart of Bordeaux's downtown. Close to lots of restaurants. A great walking neighborhood. There was something wrong with the TV and Amelie came right away and fixed it. The staff were really pleasant. The hotel is super clean! 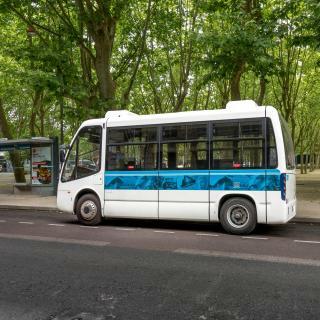 The location is walking distance to the tram if you want to tour Bordeaux. The hotel has a private car park. Staff is very friendly and helpful. Staff speaks good English. The best location in Bordeaux, right in the centre. Simple but tastefully dome rooms. The couple who run the hotel are super friendly and full of information. Close to the bridge to city center, a good breakfast cafe beside the hotel, carrefour market behind, parking lots (carrefour) with 50% discount. Beautiful boutique hotel in perfect location. A 10 min walk to the centre through a beautiful park. We loved Bordeaux and will be back. The appartment feels like a home, not a hotel room. The quiet and narrow street it's on directly leads into the city centre. i think it is a 5 or 6 rooms boutique hotel, liked the rooms also their was a nice shared living room with a nice terrace. The front desk staff, Anna and Barbara, were amazing! They were friendly, excellent English skills, and helpful. They took care of all my needs including early check-in to a quiet room. The room was pristine clean, bed is extremely comfortable, great amenities, only towel bar warmer was not functioning. The spa and message were wonderful. Comp spa for steam, sauna, whirlpool, and showers with music were a nice plus. The breakfast buffet offered a good variety including fresh scrambled eggs and gluten-free bread. At times restaurant seemed short-staffed for serving coffee and drinks but they were always friendly. The hotel is excellent if you are traveling alone. I highly recommend although had to book last minute because the Chateau Sanse was so awful. Incredible small hotel with exceptional staff, amenities, beautiful rooms, the best breakfast, fantastic location.